You quietly unzip your tent and instantly the cool, fresh morning air gently envelops your face. You walk out to the gray ashes where a fire stood last night and you throw a couple logs into the pit to start a small burn to warm yourself up this crisp mountain morning. 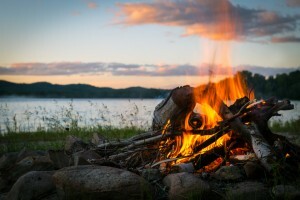 Nothing beats camping; the fresh air, the soft smell of smoke on your clothes, the dew on evergreens in the morning. It’s so nice to get away from our desktops, tablets, and cell phones for a few days and return to a simpler life, but that doesn’t mean we need to eat simpler meals. When done right, campfire cooking can be just as good or better than anything you can whip up in your kitchen. And making these delicious eats doesn’t need to be complicated. Here are a few of our favorite camping meals for breakfast, dinner and dessert. These scrumptious meals are sure to make the outdoors feel like home. Keep it simple with these super easy breakfast dishes. Simply crack two eggs into a gallon-size Ziploc bag and add all of the fixins you like: peppers, onions, cheese, ham, sausage, spinach, etc. In the morning, boil a large pot of water and cook the bags for 12-13 minutes. Carefully pull the bags out, open the contents onto a plate, and enjoy! Recipe by Chris Morocco. Photo by Kyle Johnson. Courtesy of bonappetit.com. 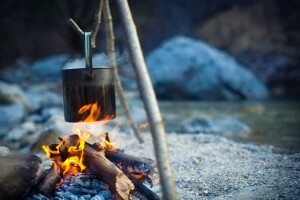 Want to try your hand at a five-star recipe in the great outdoors? Try this! Grill tomatillos and jalapenos, turning occasionally, until lightly charred and beginning to collapse (8-10 minutes), and then move them to a cutting board. Meanwhile, grill one large white onion 10-12 minutes until charred and beginning to soften. Move to cutting board as well. Finely chop tomatillos, chiles, and onion and transfer to a large skillet. Add lime juice and toss to combine. Season this salsa with salt and pepper and set it aside, keeping it warm. In a large skillet, crack 4 large eggs and season with salt and pepper. 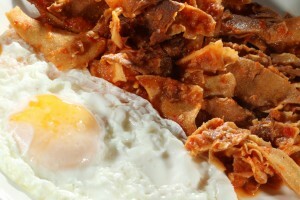 Cook for 2 minutes, rotating the skillet occasionally, until whites are golden brown and crisp at the edges and set around the yolk, which should be runny. Mix black beans and tortilla chips into salsa (add 1/4 cup of water if needed to loosen) until chips are softened; about 3 minutes. Top with eggs, dollops of yogurt, ricotta salata, hot sauce, and cilantro. Then, enjoy! This twist on a classic dish is perfect for cool summer nights by the campfire. In a large pot, saute onion, bell pepper, chile, and garlic, stirring often, for 5-6 minutes. Add turkey and increase heat. Stir often and break meat into chunks until it’s no longer pink; about 4-5 minutes. Stir in tomatoes, beans, tomato paste, chili powder, cumin, and agave. 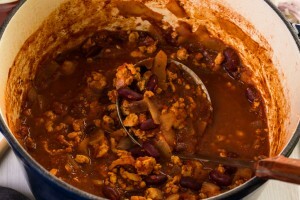 Cover and bring chili to a boil, stirring often. Then, reduce heat and simmer for 45 minutes to 1 hour, until flavors are blended. Add in lime juice and serve with cheese and cilantro. Yum! Catch some fish on your trip? Cook them using this recipe and they’re sure to melt in your mouth! Lay out four 12-inch squares of heavy-duty foil over the fire. Divide potatoes and chopped chorizo among the squares; drizzle with olive oil and season with salt and pepper. Fold edges up and over to create packets and pinch edges closed. Cook for about 25-35 minutes, until the potatoes are tender. Season cod with salt and pepper and cook until the underside begins to brown (about 4 minutes). Turn and cook for another 2 minutes, until the fish is cooked through. Top with butter. Open the packets and top the potatoes with the cod, and then dig in! 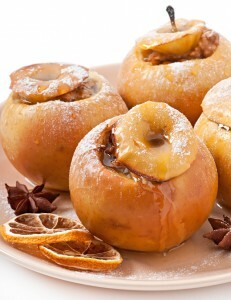 For an easy, delicious dessert, pull out the tinfoil and make Campfire Roasted Apples. Core and slice apples so that you can still fold them up in apple shape—it’s easiest with an apple slicer, but a sharp knife works as well. Set the sliced apple on tinfoil and sprinkle in sugar and cinnamon between the slices and about 1 tablespoon of butter into the center of the apple. Wrap the foil around the apple so it’s secure and then set your treats on the coals, turning them about every 5 minutes. Once all of the sides have been cooked, carefully roll the apples out of the fire and let them cool for a couple minutes before cracking open the tinfoil and digging in! Top off your idyllic camping excursion with these delectable dishes. And don’t forget to pick up your ingredients at Reams! You’ll find special deals on many of the ingredients you need to complete your trip. Cache Valley shredded cheese – $6.99 ea.